For the 50th birthday of Vincent Barbaras, the family genealogist in addition to his position as a director at EDF (Electricité de France), members of the Barbaras family decided to make a pilgrimage to Henridorff, the origin of the Barbaras family. Vincent Barbaras has been pursuing his genealogical work for ten years now. After contacting various genealogists and genealogical associations, and taking courses on deciphering old manuscripts, he has assembled a database of some 2,600 names, available today on http://barbaras.org, a bilingual web site put together by a Barbaras from the other side of the Atlantic. 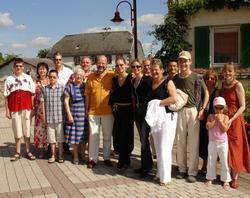 The branch from which Vincent Barbaras is descended comes from Alsace and several generations lived in Henridorff. His father, René, was born there; his grandfather, Charles lived there. On this occasion, the family was visiting the old cemetery where numerous tombstones carry the Barbaras name. An opportunity to learn more about his roots, and to relate to the younger ones the history of their ancestors. Vincent Barbaras is interested in acquiring any information or photographs that would assist him in the completion of his family tree. © Dernières Nouvelles d'Alsace, Wednesday, July 12, 2005.